Governor-General of Australia Peter Cosgrove May 25 paid a visit to the level-2 field hospital No. 1, in the Military Hospital 175 in Ho Chi Minh City. Vietnamese Deputy Defensnie Mister Nguyen Chi Vinh, hospital managers, representatives of relevant agencies and soldiers welcomed the Governor-General Peter Cosgrove. 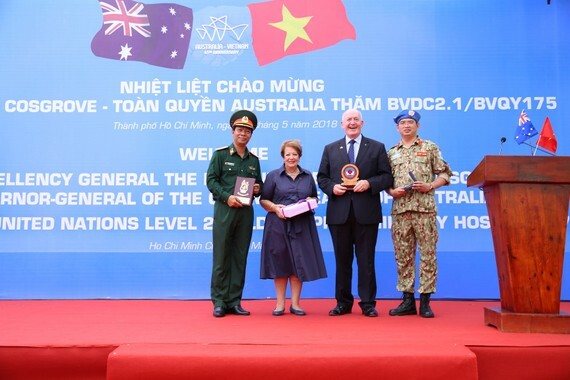 Director of the Military Hospital 175 Major General Nguyen Hong Son thanked Australia’s support for Vietnam in preparing and training staffs for the level-2 field hospital to take part in United Nations peacekeeping activities. For instance, Australia has provided English training for the staff of the field hospital as well as supported equipment. Moreover, Australia will help transport the field hospital for peacekeeping mission in South Sudan. Along with support for the level-2 No.1, Australia also provided refresh course and trained 30 medical workers. Lately, in the framework of Vietnamese Prime Minister Nguyen Xuan Phuc’s visit to Australia, managers of the military hospital 175 signed an agreement with Australia –based ICON group on training medical workers for the hospital’s tumor center. Speaking at the visit, Governor-General Cosgrove highly lauded Vietnam’s efforts in preparing personnel for UN’s peacekeeping mission manifesting its international responsibility and contribution toward world community. He affirmed that Australia will be always good companion of Vietnam in implementing peacekeeping mission in the next time.